Before I get into what my experience has been with IB, I'm going to start by telling you how I came across the site in the first place. I was unemployed for about two years. I was getting tired of reading about online scams and being asked to invest money into products that probably didn't work. I was lucky in the sense that I didn't have the money to invest in any of the things I saw on line. If I did, I probably would have wasted a lot more than my time. I decided to start taking my writing a lot more seriously and heard that writing online was a great way to earn an income online. I remember reading forums for hours and finally stumbling upon a few names like Hubpages, Squidoo, and Infobarrel. I decided to go with infobarrel. Why? I honestly think it was the name that got my attention. I signed up at the end of July of 2013 and started writing as much as I possibly could before I started my online college classes. It took a lot of focus to get settle in here, but somehow I managed to keep infobarrel on my list of things to do even with classes kicking in full swing. My original goal was to write three articles per day. I actually did that for a while, until I had to focus more on my homework assignments and then I slowly dipped from three articles per day to one per day and now I do write pretty much whenever I feel the urge to share something with the world. Why do I want to write? I'd be lying if I claimed it wasn't for the money. This is, afterall, the reason I started looking for writing sites online. I have always wanted to be a writer though, and I figured this is a great way to at least do something fun that I enjoy, build a portfolio and create an income over time. I don't know many other ways that people can become successful online without having to invest any money. 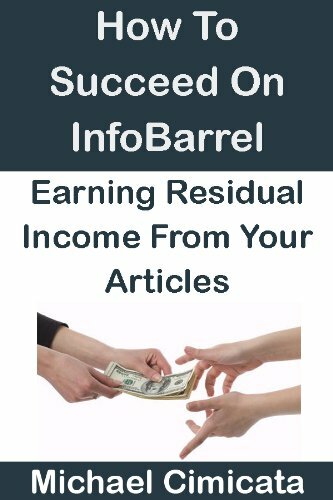 I have a goal to reach 100 articles by the end of the second month here at Infobarrel. I'll have to see how that goes. I will try to make more time writing even though school is going on full time. The site has made writing even more enjoyable because of the easy layout and elements that can be added. I've never made money online before and it was delightful to know that there are at least a few ways to make real money online. I will admit that I did promote a lot of my articles when I first signed up. I didn't expect to get much traffic since sometimes my articles can be quite random or seem less helpful than others. My earnings for my first full month here on the site are a total of $10.64. This is combining both tier 1 and tier 2 earnings. I think I simply got lucky with a few of my articles because I did manage to have a $4 day. Since then I somehow manage to make a few cents every day. It really varies. The more I write, the more I earn. It's an amazing feeling. I am ecstatic that I've managed to get a feature article in less than a month (one I actually wasn't expecting at all) even though I was a bit embarrassed by the one that was chosen to be featured. I've managed to keep a relatively steady writing pace and I don't think I've skipped an entire week of writing yet. I don't plan to. While I'm writing and building an online residual income, I do plan to do other things online in order to make ends meet. I'm looking forward to my time here and I'm really glad I decided to look into writing on the site and am even happier with the fulfillment I'm getting from doing this. $10.64 in your first month is excellent & considering it is august (reportedly the worst of all months for earnings), you are definitely doing something right! Thanks for the comment! I'm hopeful things will only get better from here!